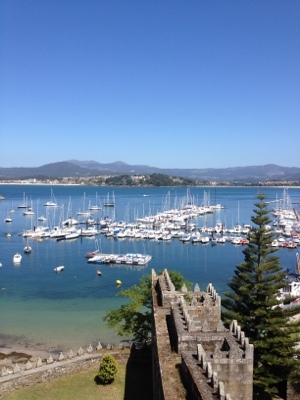 We awoke to beautiful sunshine and had a lazy morning before sailing over to Baiona (about ten miles away). It was a lovely, gentle sail downwind (wind behind us pushing us along). 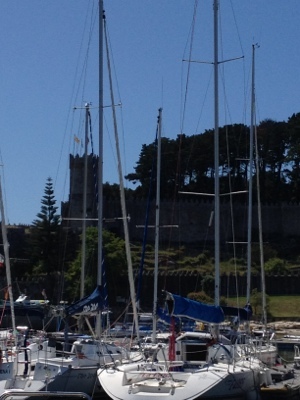 We have a place in the Real Nautica Yacht Club which is set in the old fort overlooking the bay. Above the yacht club is the Parador hotel and restaurant where an early evening drink had to be taken. This is our last night in Atlantic Spain so we have decided to go out in style and eat out for a change – probably in the yacht club, if they will let us in as it’s quite posh and we haven’t exactly packed our party frocks! Tomorrow, we continue south to Portugal, probably just north of Oporto. It looks beautiful, enjoy your adventure! Rain beating down yet again here! !